Opalescence® is a specialized take-home whitening treatment that has been designed for use during daytime hours. Opalescence® offers an excellent alternative for people who would like to have a brighter smile but do not relish the prospect of wearing strips or whitening trays all night long. In fact, Opalescence® treatment will only take one hour per day and is substantially less expensive than some in-office alternatives. Opalescence® is an extremely user-friendly home treatment. The kit includes whitening gel and special whitening trays. There is nothing complicated, messy, or time-consuming about applying Opalescence®, and it can whiten the teeth by as many as fourteen shades in as few as 10 to 14 days! How can Opalescence® help me? 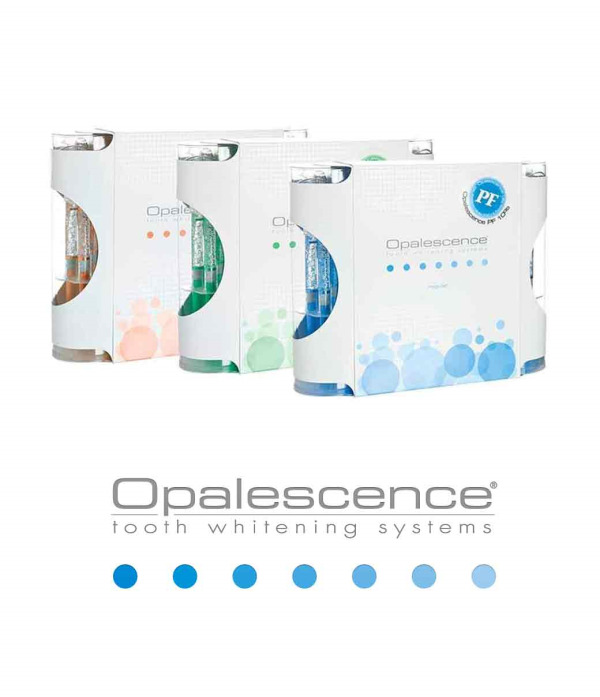 Opalescence® utilizes proven technology to remove organic stains on the teeth and whiten yellowing dentin and enamel. What are the main considerations before using Opalescence®? It should be noted that Opalescence® should only be applied to healthy teeth. Patients who have tooth decay or gum disease need to have these conditions treated prior to applying the gel. Opalescence® may not remove inorganic or deep stains, so it is important to consult with your dentist to ensure that expectations are realistic, considering the current condition of the teeth. How should Opalescence® be used? Opalescence® is a healthy way to whiten teeth. Opalescence tooth whitening gel contains PF (potassium nitrate and fluoride). Potassium Nitrate has been shown to help reduce sensitivity. Fluoride has been shown to help reduce caries and strengthen enamel. Together they help to improve the overall health of the teeth. Each syringe is filled with enough gel to treat the teeth approximately three times, so the results are under the patient’s control. To use Opalescence®, simply load the gel into the custom-made trays and apply to the teeth for up to an hour twice daily. When the desired time expires, remove the trays, and rinse the mouth. Be sure to thoroughly clean the trays after every application. Whitening will occur gradually over the course of treatment, and the end result will be a pearly white smile. If you have any questions about Opalescence®, please contact our office.